Clear bra is extremely important whether you live in Boston, New Hampshire or anywhere in New England. It’s hard to ignore that the roads seem to be getting worse by the day. There are potholes everywhere, which tend to throw up pieces of asphalt as cars drive over them and cause stone chips to the front of your vehicle. Winters in Boston can also cause serious damage to your vehicles finish due to the sand, salt and colder temperatures. Paint protection film, aka “clear bra”, is something you should seriously consider if your vehicle is new, or you if would like to keep your vehicle in ‘like new’ condition for years to come. 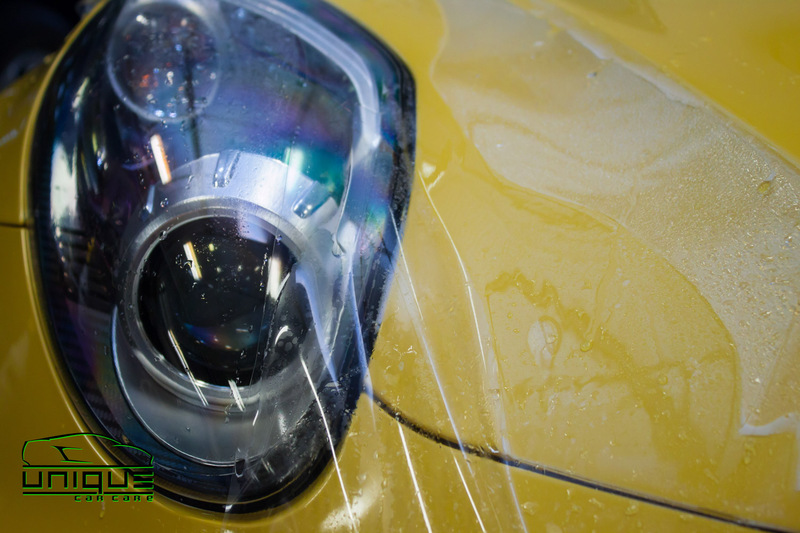 Clear bra is made of an extraordinarily tough, clear urethane film, specifically developed to protect the most vulnerable surfaces of your vehicle that are subject to stone chips, bug damage, environmental elements and minor abrasions. Each vehicle has a unique kit with specific shapes that have been designed to provide optimum protection for your car, truck, SUV or motorcycle. Paint protection film protects, yet allows a vehicles color brilliance to shine through and is barely visible. There are quite a few brands of film on the market today and our goal at Unique Car Care is to only use the best film available on the market for our clients. Since clear bra’s have gotten popular over the last decade, there are quite a few film manufacturers and installers in the Boston area that are constantly striving to out-do one another. Like anything else, there are quality films and there are poor quality films. It can get pretty confusing when trying to choose what brand of film to use, which is why we are constantly testing different films to ensure that we are using only the best paint protection films available on the market. So what should you look for when searching for a clear bra vendor in the Boston area? We tell our clients that there are many important ingredients in a quality install (proper prep, using quality film, having a skilled installer, etc…). If only one of these ingredients are missing, you are almost guaranteed unsatisfactory results. We have seen our fair share of inferior paint protection films and some pretty horrible install jobs over the years by other vendors, which is why we have focused on taking things to the next level. As with just about anything, we believe that you truly get what you pay for (“good things aren’t cheap and cheap things aren’t good!”). While our competitors survive by offering lower pricing to attract customers on a tight budget, we believe in providing our clientele with a quality clear bra installation and use only the best films on the market. You will find our pricing extremely fair compared to our competition, so make sure you do your homework instead of just opting for the cheapest price when choosing a clear bra installer in Boston, MA. If you have been searching for a knowledgeable, professional Xpel clear bra installer in Boston, MA or NH, you’ve come to the right place! There are many factors that come into play why our clear bra is different from the competition. 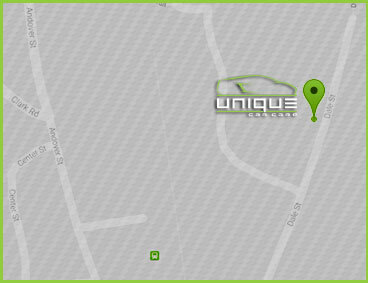 The first reason being that Unique Car Care has the industry’s top installers in the Boston & New Hampshire area. When it comes to a quality clear bra install, there are no short cuts or magical products that create these results. It all comes down to experience and taking the time to do the job right. Not only do we have the best installers in the Boston area, we also use the finest paint protection films available on the market, We invest a great amount of time researching and developing new techniques to stay on top of this rapidly changing industry. 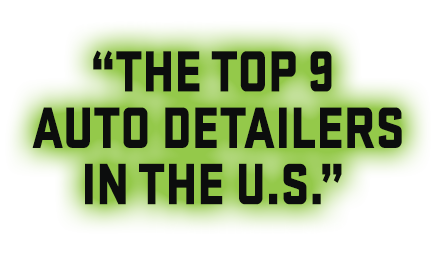 Our hard work and dedication gives you total piece of mind that your vehicle will receive the finest and safest treatment possible. Due to the shortage of quality clear bra installers in the Boston area, we have customers traveling all the way from NH, ME, RI, CT, NY and NJ. A large percentage of our clear bra installs are on new vehicles and all it takes is one drive on the highway to get your first rock chip. Having your car shipped to us is also an option to avoid any unnecessary damage on your way to our facility. We’ve even had cars shipped to us from as far away as Texas! I’m sure we can all agree that when things are rushed, corners get cut just to get the job done and the overall quality is compromised. We have found that one of the most overlooked steps in a quality clear bra installation is a proper prep of the areas receiving film. Since paint protection film is optically clear, a proper prep of the paint surface being covered in film is extremely important. You can use the best film on the market, but if there is contamination and defects present underneath the film, it will be seen and compromise the overall appearance. Seeing that Unique Car Care was rated “One of the Top Ten US Auto Detailers” by Autoweek Magazine, rated “Best Auto Detail Shop in Boston” by City Voter and recognized as one of the Top Car Detailers in the Nation by dupont REGISTRY means that your vehicle will receive nothing but the best when it comes to proper prep. This is yet another reason why our clear bra is different. 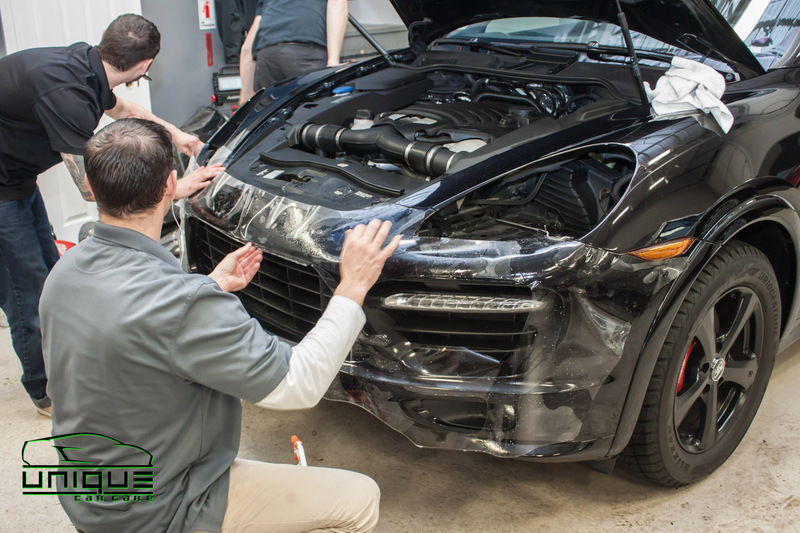 When applicable, we remove emblems, grills, headlights, headlight washers, license plates and any other obstacles that may get in the way for a much cleaner install. Since the introduction of paint protection film years ago, there has been lots of issues with excessive orange peel (film texture), cloudy film, yellowing problems, etc… As the paint protection film market evolves, it has gotten much, much better. A majority of the newer films actually have a clearcoat topcoat, much like the clearcoat on your car. The great thing about using a clearcoated film is that it can be polished to some degree if you should happen to scratch the film while washing or maybe hit a couple cones at the track. Having a clearcoat also improves durability and the appearance of the film. Some of the cheaper films on the market can look really good when first installed, but tend to yellow and turn cloudy less than a year after application. While no film is 100% perfect, it definitely pays to use a quality name brand film versus a cheap, generic film. 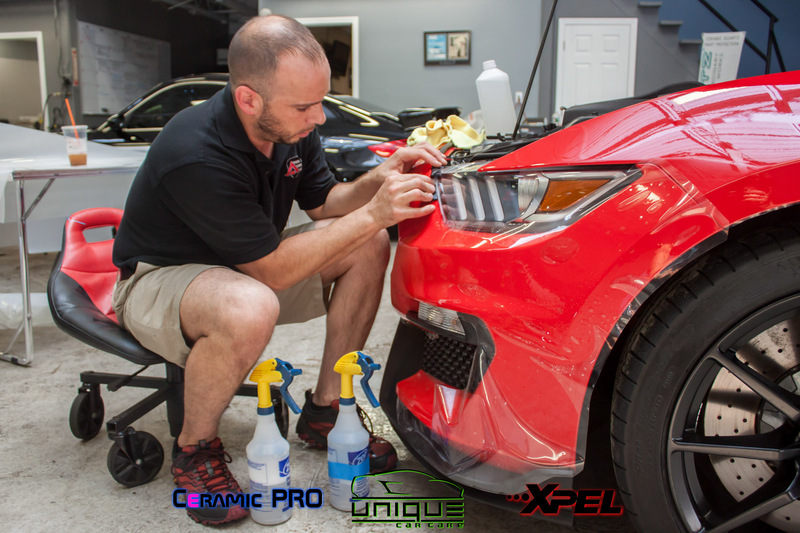 We have used just about every film on the market and our favorite is XPEL Ultimate Paint Protection Film, which combines best-in-class durability and clarity not previously available in the market. With its very low surface energy, XPEL ULTIMATE sheds contaminants that would otherwise stain or yellow conventional films. 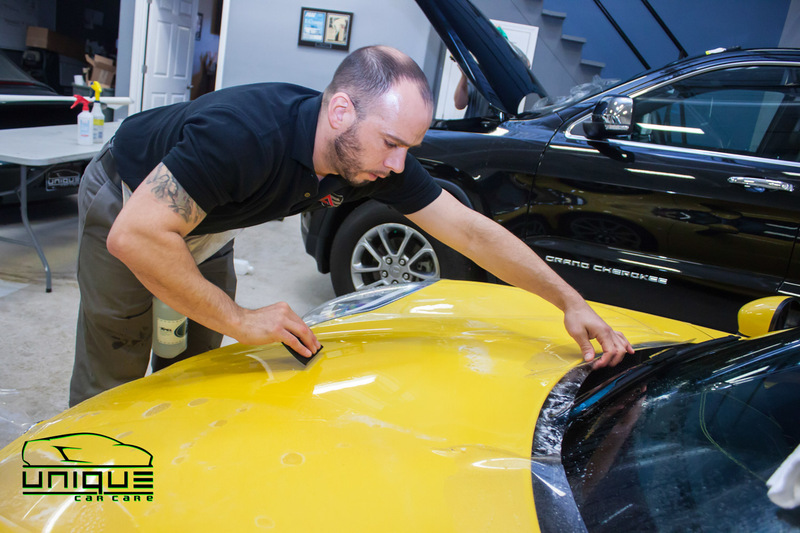 In addition, the clear coat employs special elastomeric polymers that “heal” over time eliminating swirl marks and other fine scratches without having to do anything. Although a proper prep and using a quality film is very important, one of the biggest issues I see being a detailer is poor installation quality. Most of the clear bra’s you see on the road were done at the dealership when the car was new, which are most often pre- cut kits paired with cheap, generic film. I’m sure you’ve seen at least a car or two with an ugly clear bra on the front nose, which really detracts from the overall appearance of the car. It is quite common to see film installs consisting of several pieces of film for one panel, resulting in unnecessary seams and a lack of coverage. Not only does this take away from the overall appearance of the vehicle, but it also leaves critical impact areas exposed to stone chips, which just doesn’t make sense to us. While most of the installs we perform are fully custom, we have done our research in order to choose the best computer generated pre-cut pattern software available. Even though most installers use computer generated, pre-cut kits, there is almost always some trimming necessary. This is done with an extremely sharp knife, which can cut deep into your paint if performed by an unskilled technician. We have seen this more times than not, so make sure you do your research to find a quality clear bra installer in Boston, MA before you let some hack touch your car. Cutting into the paint isn’t the only issue you have to worry about. 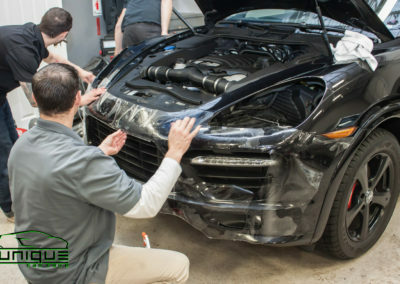 Because paint protection film is very tricky to apply, there are all kinds of issues that can arise if the installer is in a rush or isn’t properly trained. If the film is not properly installed, it can lift, bubble, have wrinkles/stretch marks, and even have discoloring aka “silvering”. If the film is installed correctly by a skilled technician, it should be virtually undetectable on the paint surface and look just like the factory paintwork. Clear bra applications can range anywhere from a basic precut kit to a highly custom install. Every vehicle is different, therefore coverage options can vary quite a bit. There are a variety of different length films available today, which allows the client to decide how much coverage they want. We are able to cover just a small portion of a panel, or have the ability to offer complete coverage. UPGRADE TO A CERAMIC COATING for additional protection and easy maintenance with no need to wax! For those looking for maximum coverage, it doesn’t get much better than a full vehicle wrap. All panels are completely covered and we do our best to make it virtually undetectable. Depending on the customers expectations and budget, we have the ability to remove the side mirrors, door handles, bumpers, etc. in order to achieve the best possible install. *When applicable, we remove emblems, grills, headlights, headlight washers, license plates and any other obstacles that may get in the way for a much cleaner install. How do I care for my paint protection film? Will Opticoat or cQuartz hurt the film? Sealants such as Opticoat and cQuartz will not hurt the film or interfere with our Ultimate paint protection film’s self healing properties. Can/should Opticoat or cQuartz be applied to the car before the film is installed? We do NOT recommend applying sealants such as Opticoat or cQuartz to the parts of the car that will be covered with film. The low surface energy of paint sealant products such as these will cause adhesion problems both during installation and over the life of the product. In addition, it is worth noting that there is really no benefit to applying sealant to the paint before the film anyway, since the film will provide far more environmental protection to the paint than a sealant ever could. How long should I wait to apply a clear bra if my car has been repainted? You will need to talk to your body shop and see what they recommend. 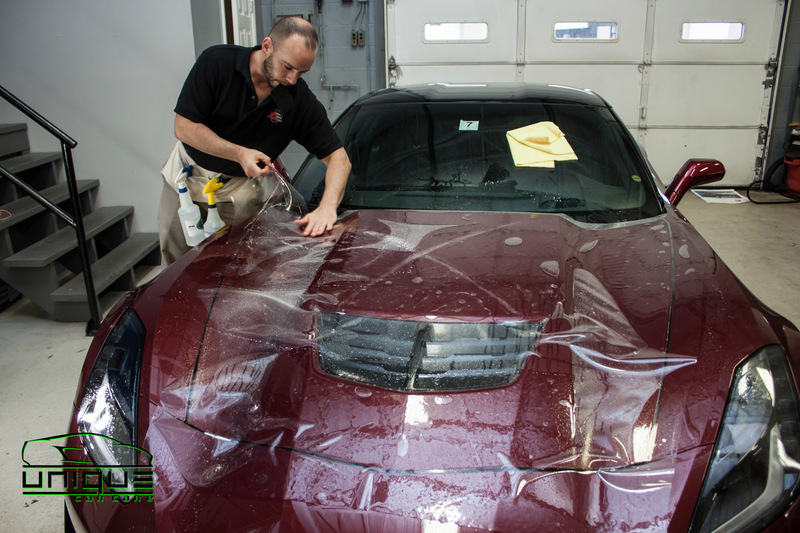 The time will vary depending on the paint system the body shop used. In any case, the time that they recommend you should wait to wax the paint, is the same time you will need to wait to install our product. With this technology, there is no limit to the number of times the clear coat can heal itself. As long as the clear coat is not penetrated it will heal over and over again. 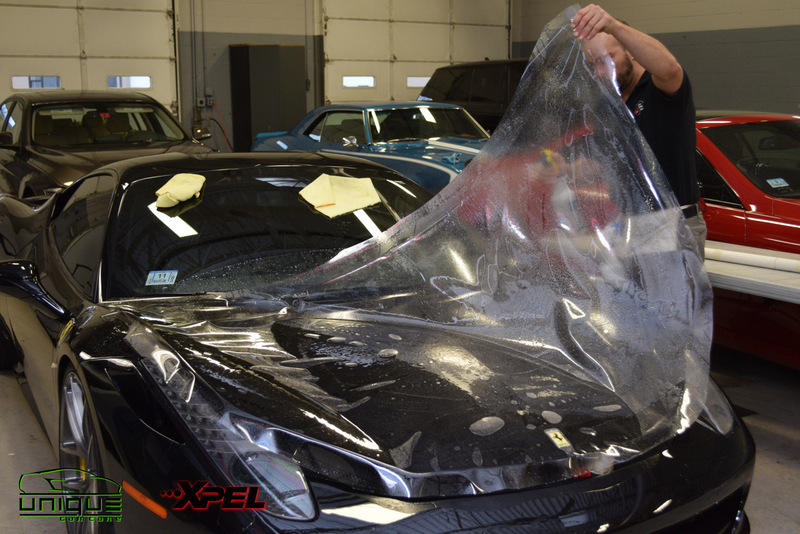 How does XPEL Paint Protection Film resist staining? The clear coat on XPEL ULTIMATE has a very low surface energy, which makes it extremely difficult for organic compounds to stick to the film. Insects, bird droppings and environmental contaminants (which would normally cause yellowing) such as road oils, exhaust smoke and pollution can be removed during regular washing. How deep a scratch will heal and how long does it take? The clear coat is designed to heal surface scratches and common swirl marks that occur during routine washing of the car. If the scratch penetrates through the film’s clear coat, it will not heal. The time for a scratch to heal depends on the severity of the scratch and the ambient temperature. Minor scratches usually heal in one hour at room temperature (72°F). In warmer climates, healing time will be shorter. The healing process can be accelerated at any time by pouring hot water over the scratched area. Will XPEL make the paint underneath the film fade at a different rate? No. XPEL ULTIMATE Paint Protection Film allows UV to pass through the film and fade the paint underneath at the same rate as the exposed paint. How long will the clear coat last? Depending on how the film is cared for, the clear coat can last indefinitely. Regular washing and waxing will keep the clear coat in top condition for years to come. If ordinary car wash or soap and water will not remove a stain, there are a variety products available to do the job. In most cases simple isopropyl rubbing alcohol will remove anything on the surface of the film. In cases of more severe staining, or where something has been left on the film for a long period of time, a sparing amount of lacquer thinner can be used. Bug and tar remover available at any auto parts store is also effective. If you are unsure about the use of any other chemical on the surface of the film, please contact XPEL Support at 800-447-9928 for assistance. 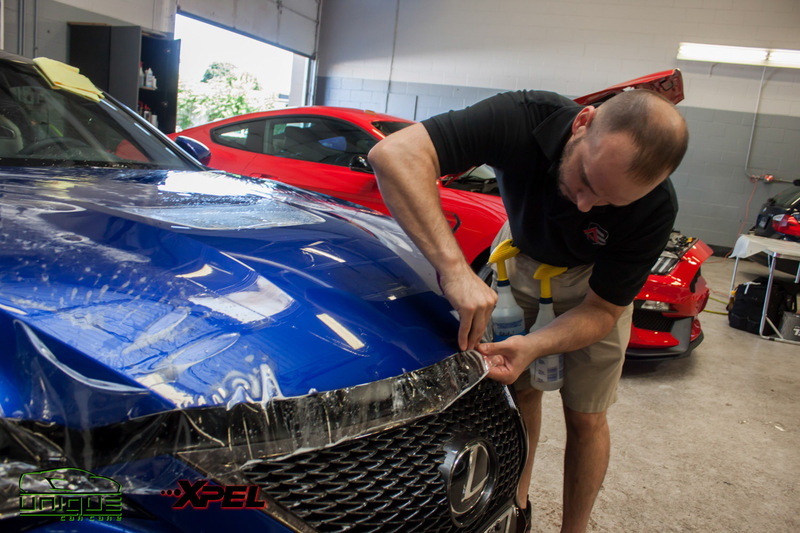 Unlike most paint protection films on the market, XPEL ULTIMATE Paint Protection film can be waxed and sealed just like your paint. Though XPEL Flawless Finish Paint Protection Film Sealant is still the preferred product, Any automotive wax or sealant may be used.